In August 1752, a meeting of the leading inhabitants of Belfast led to the founding of the Belfast Charitable Society. 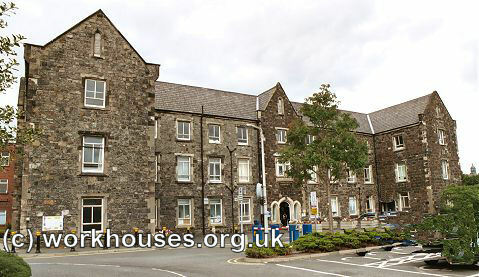 Amongst the Society's aims were the setting up of a poorhouse and infirmary — "a poor-house and hospital are greatly wanted in Belfast for the support of vast numbers of real objects of charity in this parish, for the employment of idle beggars who crowd to it from all parts of the North, and for the reception of infirm and diseased poor." The scheme was financed by members' subscriptions and a nationwide lottery was also set up to help generate funds. It took almost two decades for the plans to come to fruition. Land for the buildings was donated by Lord Donegall in the then countryside at the north of Belfast, now the New Lodge area. Plans were then invited for the building of a poor-house and hospital, the cost of which was to be £3,000. The building materials — stone, sand, lime and water — were to be supplied by local people. Approval was given for the designs submitted by a Mr Cooley of Dublin for a poor-house accommodating 36 inmates and a hospital containing 24 beds. The building also included assembly rooms for the use of the townspeople and profit of the charity. THIS FOUNDATION STONE OF A POOR-HOUSE AND INFIRMARY FOR THE TOWN AND PARISH OF BELFAST WAS LAID ON THE FIRST DAY OF AUGUST, A.D. MDCCLXXI, AND IN THE XI. YEAR OF THE REIGN OF MAJESTY GEORGE III THE RIGHT HONOURABLE ARTHUR EARL OF DONEGALL AND THE PRINCIPAL INHABITANTS OF BELFAST FOUNDED THIS CHARITY; AND HIS LORDSHIP GRANTED TO IT IN PERPETUITY EIGHT ACRES OF LAND ON PART OF WHICH THIS BUILDING IS ERECTED. The hospital opened for the admission of the sick on the 17th of September, 1774. The hospital was where the first trials of inoculation and vaccination took place in the north of Ireland. In March, 1800, a resolution was passed permitting Dr Haliday to try the experiment of vaccination on a few children in the poor-house, provided the consent of their parents was obtained. The establishment also set up wards for the treatment of lunatics. The Belfast Charitable Society is still in existence and in 2002 celebrated its 250th anniversary. Clifton House was refurbished in 2016 and now offers tours of the building and facilities for the hosting of events. A House of Industry "for the suppression of mendicity and the promotion of industry among the poor" was established in Smithfield in 1809 and supported by voluntary contributions. The unemployed poor were set to work at occupations such as weaving, spinning, knitting, and net-making and their earnings were supplemented by donations of food and clothing. According to Samuel Lewis's 1837 Topographical Dictionary of Ireland, the House also "assists poor housekeepers, relieves strangers and forwards them to their destination, supplies deserving mendicants with food and punishes the refractory, accommodates industrious families with small loans or occasional grants, and has diffused great benefit over this populous town, in which it has entirely abolished mendicity." In around 1812, the House of Industry refused to accept the money raised by an amateur theatrical performance on the ground that it was sinful to accept money acquired by such means. Co. Antrim: Ballygomartin, Ballymurphy, Ballysillan, Belfast (10), Carnmoney, Greencastle, Whitehouse. Co. Down: Ballyhackamore, Ballymacarrett (2), Castlereagh, Dundonald Church-quarter, Hollywood. The Board also included 7 ex-officio Guardians, making a total of 29. The population falling within the union at the 1831 census had been 80,512 with divisions ranging in size from Ballygomartin (population 1,098) to Belfast itself (55,031). The new Board of Guardians held their first meeting on 1st January 1839. John Rowan, Chairman of the Justices of the Peace, was elected Chairman of the Board. A twelve-acre site for a workhouse was purchased in March 1839 from John Alexander at £280 an acre. It was situated at the south-west of the city between the New Lisburn Turnpike (toll) Road at the east, and Blackstaff Loaning (now Donegall Road) at the north. 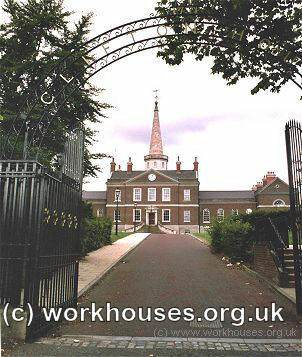 The new workhouse was designed by George Wilkinson to accommodate 1,000 inmates. The building work was was contracted to Arthur Williams and Sons. The cost of the building was £7,000 plus £2,869 for fixtures and fittings etc. It was declared fit for the admission of paupers on 1st Jan 1841, and admitted its first inmates a few months later on the 11th May. The location and partial layout of the site are shown on the 1904 OS map below. 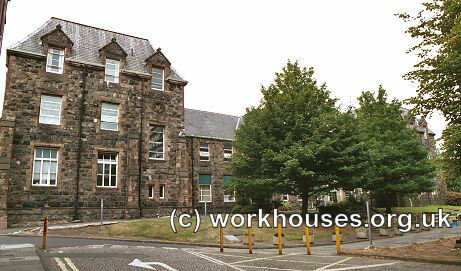 The original core workhouse followed one of Wilkinson's standard designs with a front block housing receiving rooms on the ground floor and a board-room on the first floor. A four-storey central block housed dormitories, school rooms, day rooms, kitchen and food-serving rooms. 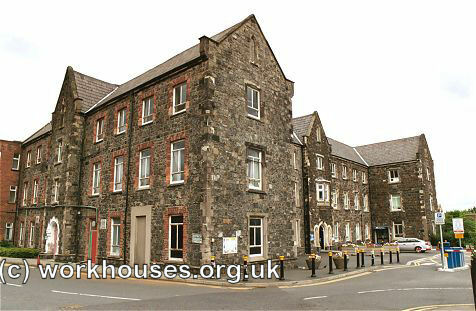 The rearmost block housed the workhouse infirmary. During the famine in the mid-1840s, sheds and sleeping galleries were erected to accommodate an additional 747 inmates. A large fever hospital originally accommodating 159 patients was opened in January 1847. This H-shaped building was based on two standard T-shaped fever hospital blocks placed back-to-back. Belfast fever hospital from the south-east, 2003. Belfast fever hospital from the south, 2003. In 1848, A school was erected at the south-west of the workhouse to provide classrooms and accommodation for 1,300 boys and girls. In 1851, Mr Senior, a government inspector, recommended that beds should sleep two rather than three children. Much of the workhouse grounds were cultivated to provide food for the workhouse. In 1869, the produce included five acres of cabbages, two acres of potatoes, two acres of turnips, one and a half acres of hay, and five acres of potatoes. In 1869, the Board of Guardians decided to convert the original school into an infirmary. A new school building was opened in October 1874 behind the original school. The second school cost £10,500 and housed 450 girls and boys. In 1923, it was converted for the treatment of the mentally and became known as Windsor Hospital. The dwindling number of children were moved to a new building next the administrative block. Belfast second school from the north-west, 2003. Wings were added at each end of the infirmary (the original school block) in 1900 to increase the hospital accommodation. A nurses' home was built in 1892, later becoming the doctors' home. Destitute pregnant women were catered for in the workhouse, first in a Ward 11 of the infirmary which was designated as a lying-in ward, and from 1892 in a 30-bed maternity block known as Ivy Cottage. At the date of the 1901 census, the workhouse population included 166 officials and their families, and 3,359 inmates. During the First World War, parts of the hospital provided treatment for locally garrisoned soldiers, and later for troops injured in France. During the Second World War, the hospital provided treatment for civilian air-raid casualties then becoming Belfast City Hospital. The front block, main building and infirmary are now all demolished but the former fever hospital and second school survive. 1905 — Master: Robert H Wilson; Assistant Master: Thomas Ball; Matron: Miss Anna W Graham; Superintendent Nurse: Miss Sarah Ward; Schoolmaster: John Sprott; Schoolmistress: Miss Isabella Clawson; Protestant Chaplain: Rev SE Busby; RC Chaplain: Rev Jospeh Boylan; Presbyterian Chaplain: Rev John M McIlrath; Bandmaster: Frederick May. Clifton House — the institution's Admissions, Deaths, and other records are currently (2016) being digitized. Public Record Office of Northern Ireland, 2 Titanic Boulevard, Titanic Quarter, Belfast BT3 9HQ. Holdings include: Board of Guardians' minute books; Workhouse registers; Indoor relief lists; Return of deaths; etc. An Interesting and Honourable History by Jonathan Bardon (Belfast Charitable Society, 2003). Poor Law Relief and the Role of the Belfast Board of Guardians from 1850 to 1900 — a paper by Piere-Vincent Moreau. Poverty Relief and the Economic Crisis in the Region of Belfast from 1921 to 1939 — a paper by Piere-Vincent Moreau. Clifton House Heritage Centre — information on tours and event hosting.